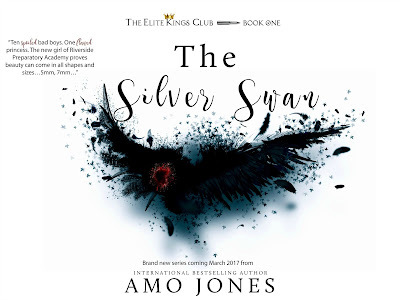 Amo Jones is a new to me author and I was drawn to this book because of the synopsis and the beautiful cover. Silver Swan did have a “flavour” of another book I have read but the plot and style of writing bear no resemblance to one and other. My other thought while reading this book was actually the haunting voice from the “Saw” films… “Do you wanna play a game?” and I have to say, that this freaked me out. Those films scared the crap out of me and all this “riddle me this” just brought those blood curdling scenes to mind and gave me the heebie jeebies…this book does not have that…yet, but nothing would surprise me in books to come. This book definitely has me intrigued and I cannot wait to see where the author takes this next. 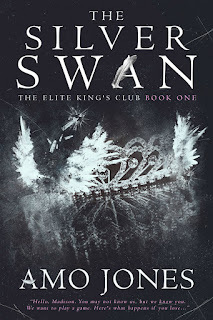 Madison Montgomery comes from money and now that her dad has a new woman on his arm she has been moved to The Hampton’s and is starting a new, exclusive private school, oh and she also has a rather annoyingly handsome step-brother who just so happens to be one of the “Elite Kings Club” members. Madison was a ballsy, gun toting heroine that wasn’t intimidated by this band of merry men and this was quite refreshing. Madison gave as good as she got even if that did give rise to some awkward and dangerous situations. The Elite Kings Club has an air of myth and folklore about it among the gossip mongers but it is far from legend. This club and its members are not well regarded and are deemed extremely dangerous, the kind that you are warned to stay away from…and definitely not sleep with, but that is hard to do when all of them are drop dead gorgeous, intriguing and friends of your step-brother. Amo Jones certainly managed to keep that air of suspense and intrigue running throughout this book and that definitely left this reader on the edge of her seat, frantically turning pages just to see what on earth would happen next. My head is still running a mile minute trying to understand what was genuine and what wasn’t and how the ending justifies the actions and events that transpired before it. The added diary entries from times gone by only added to my fascination as to how this all tied together. For me personally, I did find the ending a little rushed, and the pacing was vastly different from the rest of the book. This may be intentional by the author to ramp up the heart rate as you go into the grand finale but I would have liked a little more background in that regard. However, I do feel that the explanations I crave will be addressed in the next book and I cannot wait for that one to drop. Yes, this book is crazy, yes, it is definitely fucked up, but it is like car crash TV, highly entertaining, highly addictive and unputdownable. Bring on book 2.